Bud, the rabid Bambi killer! He who is known among the tribes as "Hunts with sticks"! When they chastise me for killing Bambi, I'll tell 'em the deer had rabbis and it killed three people before I was able to bring the beast down! Just tell them that wild Bambis kill more people every year than any other wild animal in the U.S.. You don't have to tell them that most of them do it by crashing through windshields. But it is startling how many people are killed in attacks by wild deer. — and spots the mounted deer head on the wall, along with the two used bows he ends up buying for himself and a friend. They use them when they (and two other buddies) attempt to masquerade as the amateur superhero group they invent, the Bowmen. 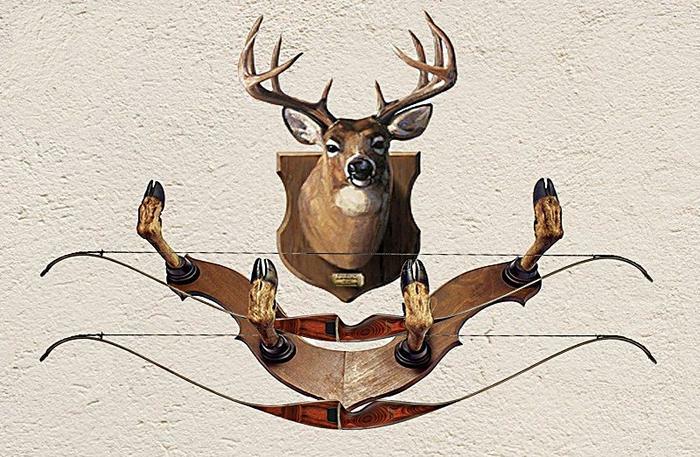 The picture below is a composite of four separate elements I put together with Paint.net: (1) the stucco wall, (2) the deer head, (3) the double-hooves bow holder, and (4) the two bows.